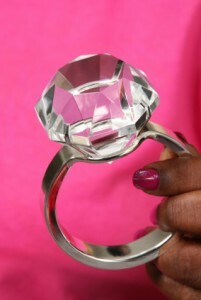 Let’s say that I buy my wife a two carat diamond ring. At the same time, you buy your wife a one carat diamond ring. Let’s also assume that the diamond I buy is not very good quality — it has a few flaws, the cut is not great, and the color is a little off. Your diamond, on the other hand, is superb — it’s flawless and clear and the cut is spectacular. In fact, though the diamond you bought is half the size of the one I bought, your diamond cost more — maybe quite a bit more. So, in the Best Husband Sweepstakes, who won? Well, I did. Even though it takes four C’s (cut, color, clarity, and carat weight) to measure a diamond’s quality, people really only talk about carats. When your wife flashes her diamond, no one asks, “Gosh, what clarity is it?” The only question is, “Wow, how many carats is that thing?” You bought a better diamond but I win the opinion poll. It hardly seems fair, does it? You’ll know in your heart of hearts that your wife has a better ring. So will she. But in the “marketplace” of public opinion, two carats is better than one. I thought my last company, Lawson Software, was doing a very good job at improving customer satisfaction. But what about our stock price? It was doing reasonably well, considering all the changes, but it wasn’t outpacing the market. So another company bought us. Our customers were getting happier but they were no longer our customers. Landline telephone companies thought they were being evaluated on the quality of their calls. Did it sound like the person you were calling was right next door? That was important up to a point but, beyond that point, mobility and convenience were much more important. The landline companies were toast. Your local bookstore thought it was being judged on the quality of its collection and customer service. That worked well for a long time. Then people decided that what they really wanted was the information inside the book rather than the physical book itself. Ooops! Do you really know how you (or your company) are being judged? Maybe it’s time to step back, look around, and re-evaluate. Ask around. Do some research. Evaluate what other people are evaluating. It’s good to know about cut, color, and clarity. It’s crucial to know about carats.